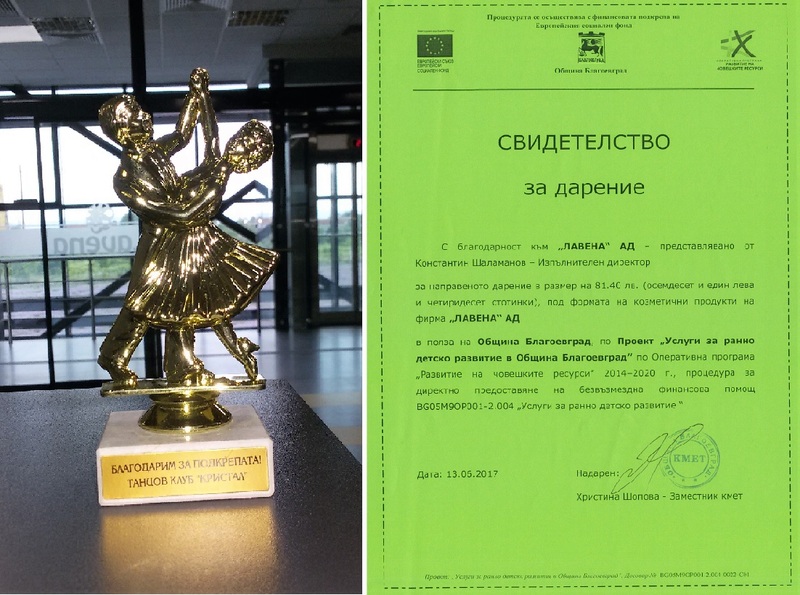 1,173 products Bochko were donated to Association Sports Club “Crystal”, Varna city and to Municipality of Blagoevgrad in favour of Project “Early Childhood Development Services in Municipality of Blagoevgrad”. 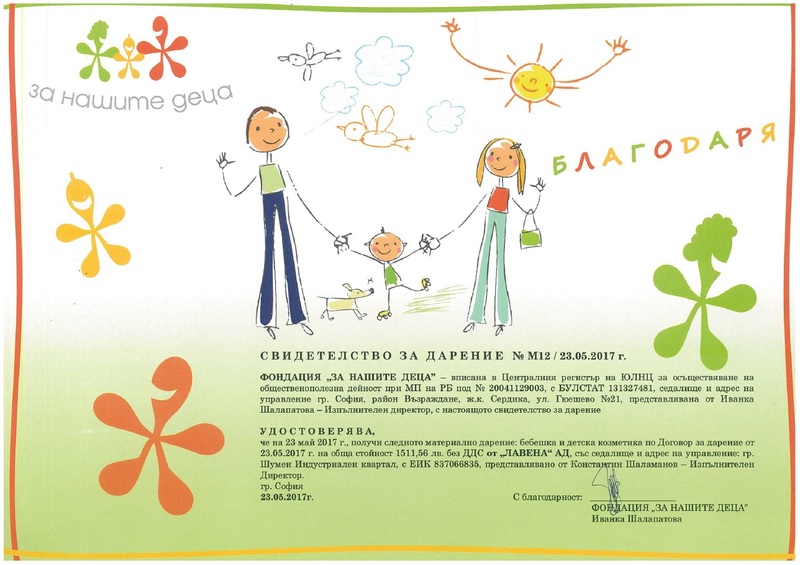 3160 products under the brand Bochko and 5284 different Lavena products under the brands My Rose, Maternea, Footprim, Tetradent, My Nature and Working hand were donated to the District council of the Bulgarian Red Cross, Shumen city, and to the “For our Children” Foundation, Sofia city. 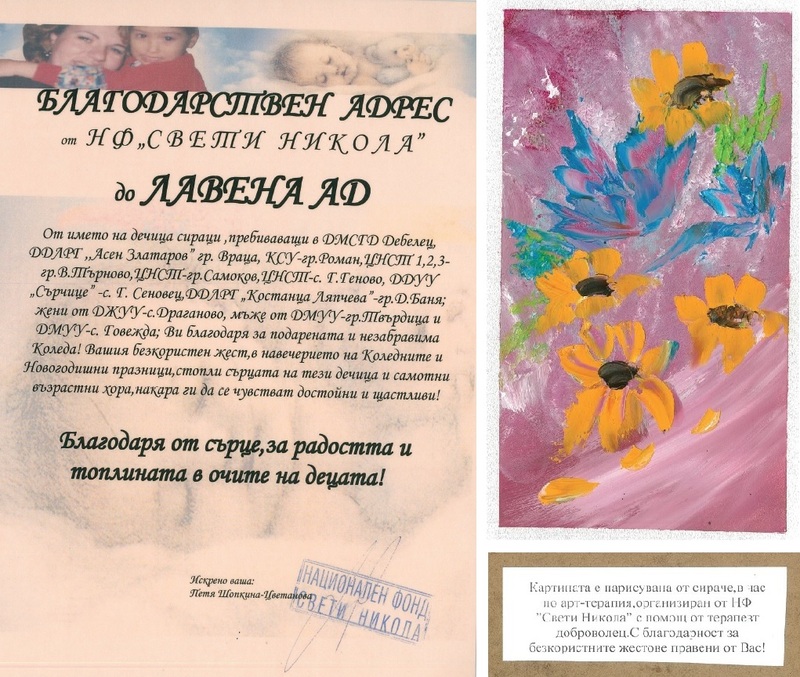 2,542 baby and kids care cosmetic products were donated to daily care centre for children with disabilities –“Kalinka“, v. Vasil Drumev, Shumen municipality and kinder garden “Zaraisk”, v. Zaraevo, Popovo Municipality, Targovishte Region. 12,602 different Lavena products were sent to the National Fund “Saint Nikola”, Sofia city, 227 A. Stamboliyski Blvd. ; Kids with Developmental Problems Foundation, Vitosha, Sofia District, Sofia Municipality; Center for Social Rehabilitation and Integration for People with Disabilities, represented by the Municipality of Shumen, Shumen city, 17 Slavyanski Blvd.